The Samsung handset parade continues as the Korean firm launches another two phones, apparently targeted at a younger audience. There's not a lot to choose between the Samsung Galaxy Pocket Neo and Galaxy Star, with both handsets sporting 3-inch QVGA displays, 2MP rear cameras, 512MB of RAM, 4GB of internal storage, micro SD slots and 1200mAh batteries. In terms of processors the Galaxy Star is the slightly more powerful option packing a 1GHz single-core chip, while the Pocket Neo gets by with an 850MHz offering. There's good news in terms of software though, with both devices packing Android Jelly Bean - it's the slightly older 4.1 version but an update to 4.2 is surely on the cards. Both weigh in at a feather-light 100.5g and with the mediocre feature list you can expect the Galaxy Star and Galaxy Pocket Neo to settle in at the bottom end of Samsung's price range. They will be available in both single and dual-SIM varieties, although we expect markets such as the UK, US and Australia to only see the single SIM options. 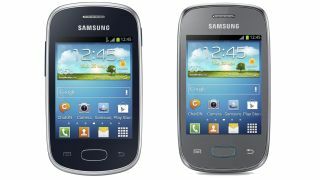 As far as a release date for the Galaxy Star and Galaxy Pocket Neo goes, both are currently unknown as is the price. A Samsung UK spokesperson told TechRadar: "We believe the Galaxy Star and Galaxy Pocket Neo will be coming to the UK, but we're waiting for final confirmation."